, the author of an excellent illustration of the Book of Common Prayer, was born Feb. 6, 1686, in Paternoster-rosv, London. 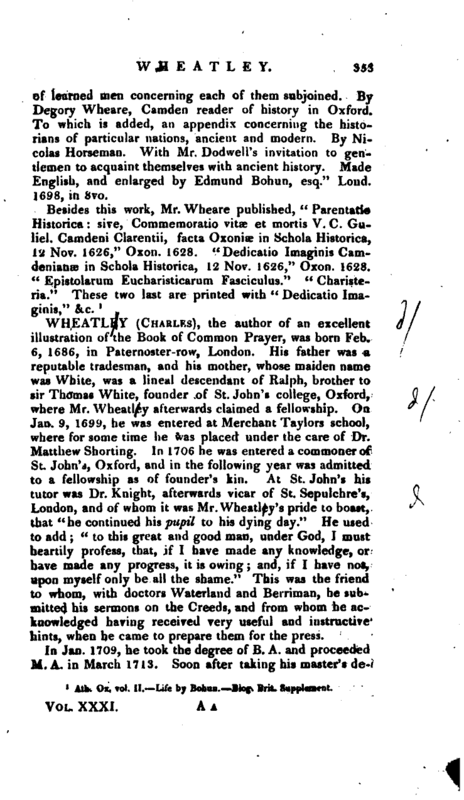 His father was a reputable tradesman, and his mother, whose maiden name was White, was a lineal descendant of Ralph, brother to sir Thomas White, founder of St. John’s college, Oxford, where Mr. Wheatley afterwards claimed a fellowship. On Jan. 9, 1699, he was entered at Merchant Taylors school, where for some time he was placed under the care of Dr. Matthew Shorting. In 1706 he was entered a commoner of St. John’s, Oxford, and in the following year was admitted to a fellowship as of founder’s kin. At St. John’s his tutor was Dr. Knight, afterwards vicar of St. Sepulchre’s, London, and of whom it was Mr. Wheatley’s pride to boast, that “he continued his pupil to his dying day.” He used to add; “to this great and good man, under God, I must heartily profess, that, if I have made any knowledge, or have made any progress, it is owing; and, if I have not, upon myself only be all the shame.” This was the friend to whom, with doctors Waterland and Berriman, he submitted his sermons on the Creeds, and from whom he acknowledged having received very useful and instructive hints, when he came to prepare them for the press. In Jan. 1709, he took the degree of B. A. and proceeded M. A. in March 1713. Soon after taking his master’s | degree, he resigned his fellowship, and in August of the same year, married Mary, daughter of Dr. William Findall. Not Jong after his marriage he removed to a curacy in London, and in 1717 was chosen lecturer of St. Mildred’s in the Poultry. 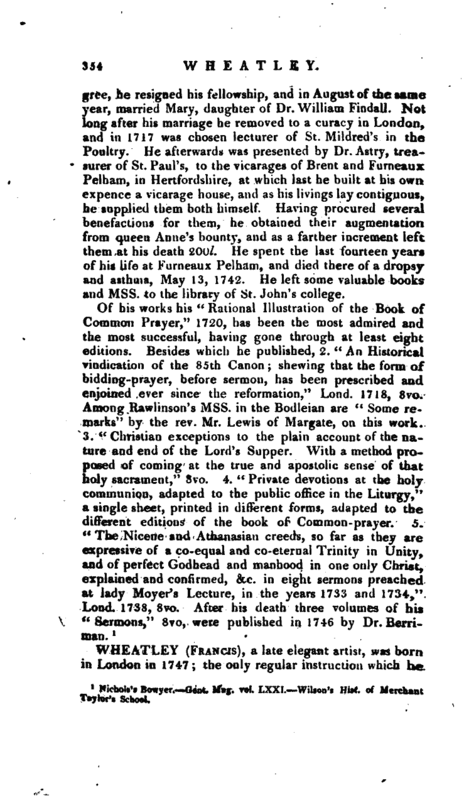 He afterwards was presented hy Dr. Astry, treasurer of St. Paul’s, to the vicarages of Brent and Furneaux Pelham, in Hertfordshire, at which last he built at his own expence a vicarage house, and as his livings lay contiguous, he supplied them both himself. Having procured several benefactions for them, he obtained their augmentation from queen Anne’s bounty, and as a farther increment left them at his death 2OO/. He spent the last fourteen years of his life at Furneaux Pelham, and died there of a dropsy and asthma, May 13, 1742. He left some valuable books and Mss. to the library of St. John’s college. Nichols’s Bowyer. —Gent. Mag. vol. LXXI, Wilson’s Hist, of Merchant Taylor’s School.